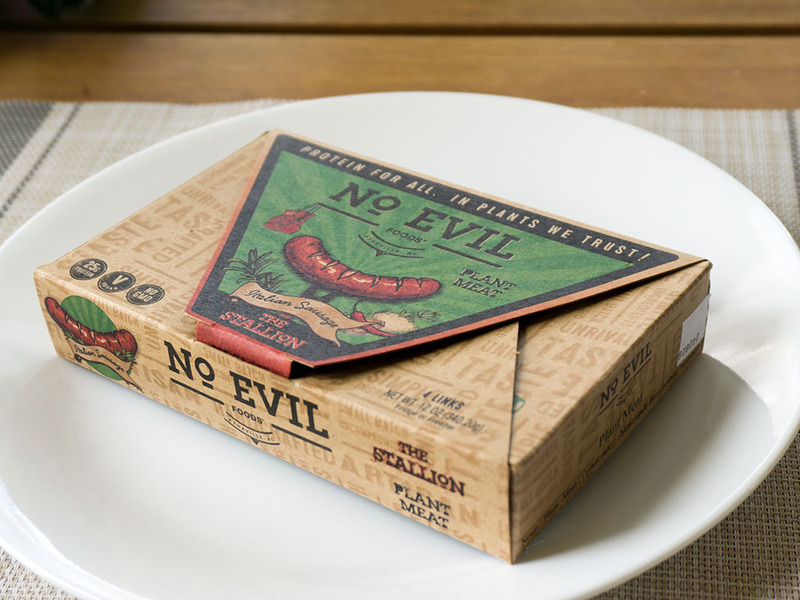 Are No Evil The Stallion Sausages any good? Yes! 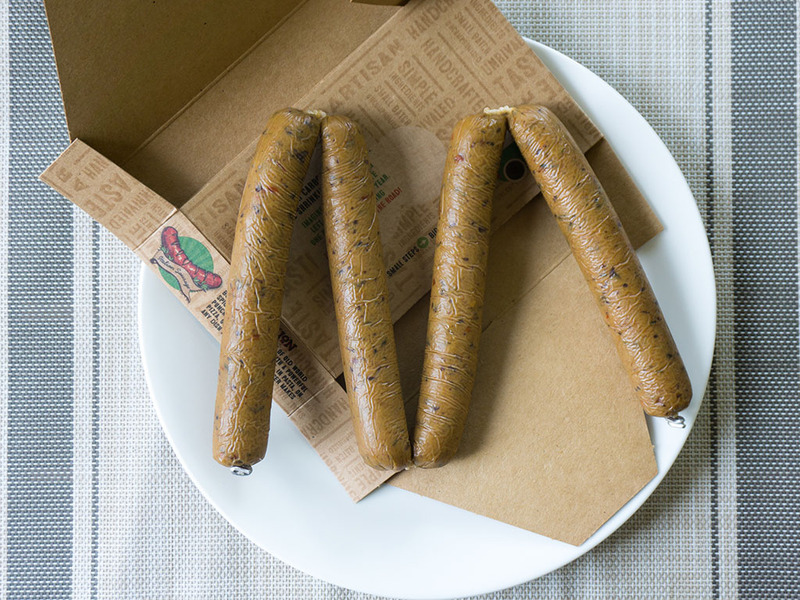 These are excellent vegan sausages. Fennel forward flavor with a meaty texture. 25g of protein doesn’t hurt either! I was immediately drawn to this product by the classy packaging; a handsome cardboard box that screamed quality. Right into my shopping cart they went. I almost didn’t want to throw away the packaging if I’m honest, but hey, lets not get into hoarder territory right. 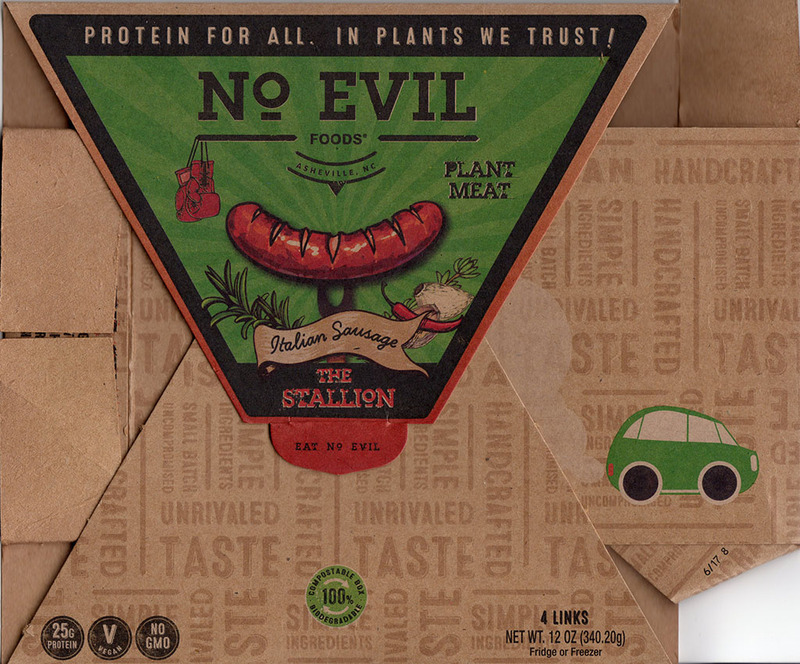 I hadn’t heard of this company until finding these 100% vegan sausages at my local Whole Foods. 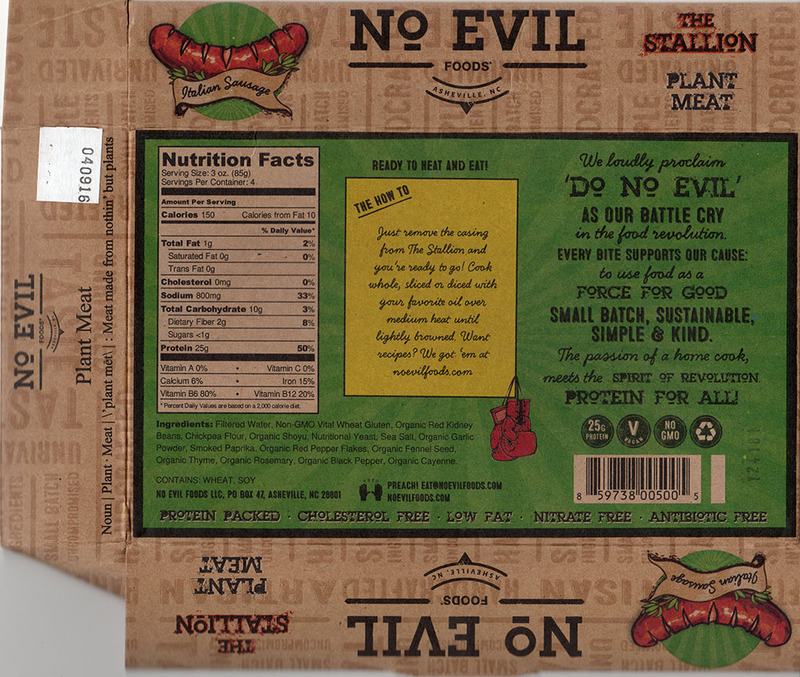 No Evil Foods are out of Asheville, North Carolina, and I’m excited to run into more of their products out on my shopping adventures. 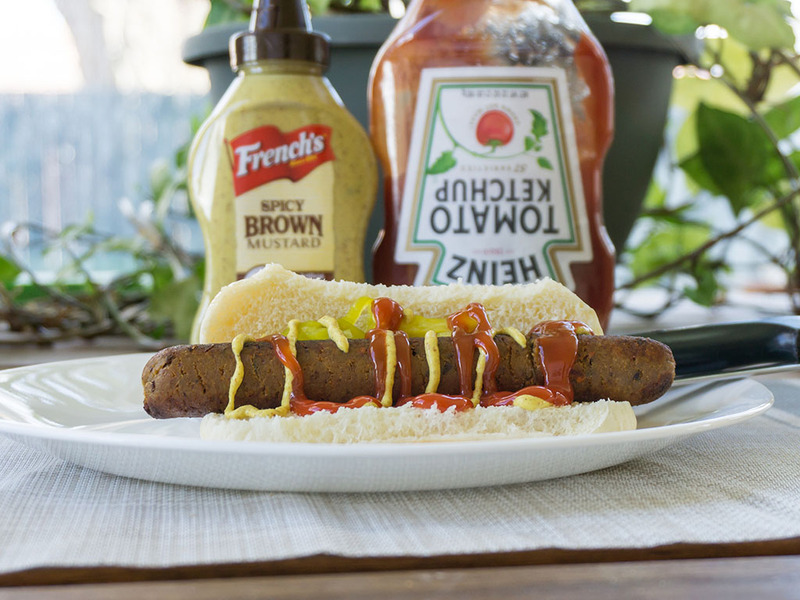 Flavor wise these are not dissimilar to other plant based sausage substitutes. If you’re familiar with Tofurky or Field Roast products, you’re on the right path texture wise. 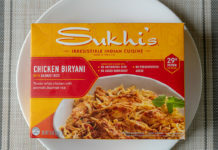 In terms of flavor these are very fennel-forward which I personally am a big fan of; there’s a little rosemary and spice on the back end as well. 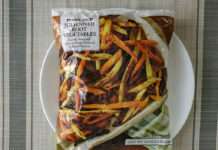 These hold up very well in the pan to aggressive cooking, I’d be more than happy to throw these on the BBQ as well. 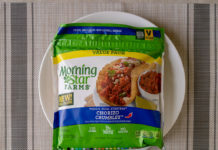 Once you’ve unpackaged these, throw them into the pan with a little oil and cook until you’re happy. No more than three to five mins, just get a little sear; they can spit a little as they brown so you might want to cover your pan with a lid. 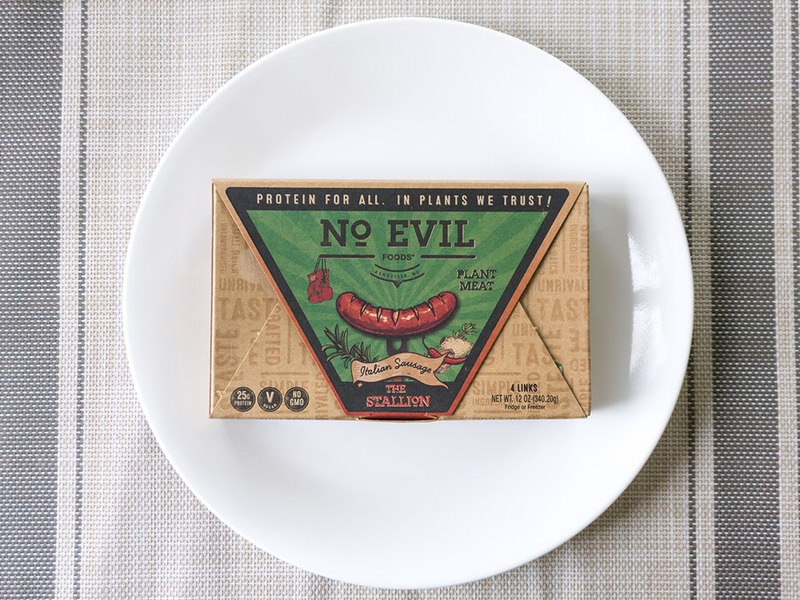 These sausages pack in 25g of protein each which is huge. Salt is a little high (as are all products in this category though) but I’d be surprised if the average person would want to chow down on two in one sitting. Side note: I have and I was stuffed silly. Happy but stuffed. Four links come in the packaging, wrapped up tight in plastic wrap. Each link is tied off at the end so you can unpack them one by one as you need. Well, first and foremost, get these guys on a hot dog bun with your favorite toppings. You might want to buy slightly larger buns for these hefty dogs, as you can see below. Other than that, I’d use this product for maybe vegan pizza toppings or diced into a pasta sauce. Texture wise I wouldn’t use these as a ground meat sub.